I am a Foodie through and through. I love food. I love to eat. I love eating as much as I possibly can. I love trying different food items. I just am a Foodie. So, when I spot a new or unusual item, chances are I am buying it. My reason is always for Grandma’s Backyard but, in my heart, my reason is simple – I am a Foodie. While this is a term used far more frequently now then ever before, I have related with this term for a loooong time. Even before the Backyard, I was taking images of food…reading menus for the heck of it…and documenting everything I ate. 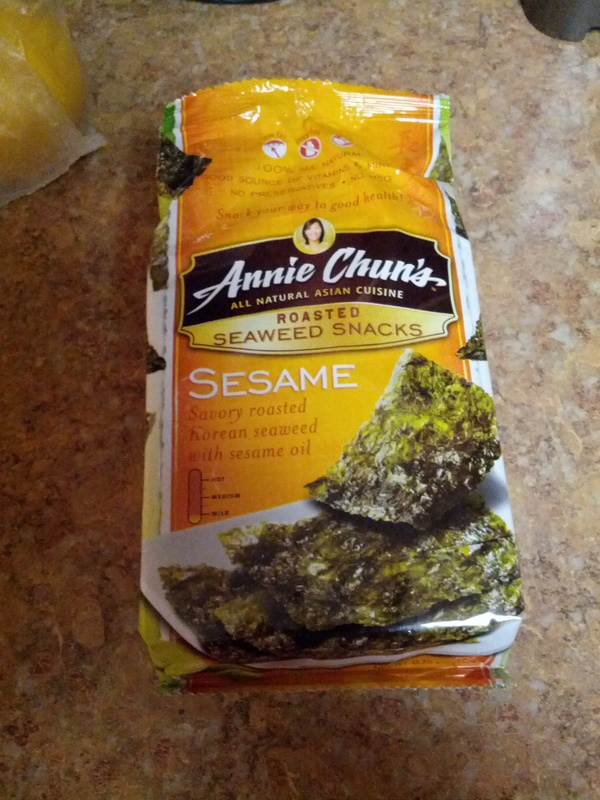 A few weeks ago at Whole Foods, we spotted these Annie Chung’s Seaweed Snacks. Well, this was an easy purchase. Why? Because I am a Foodie. 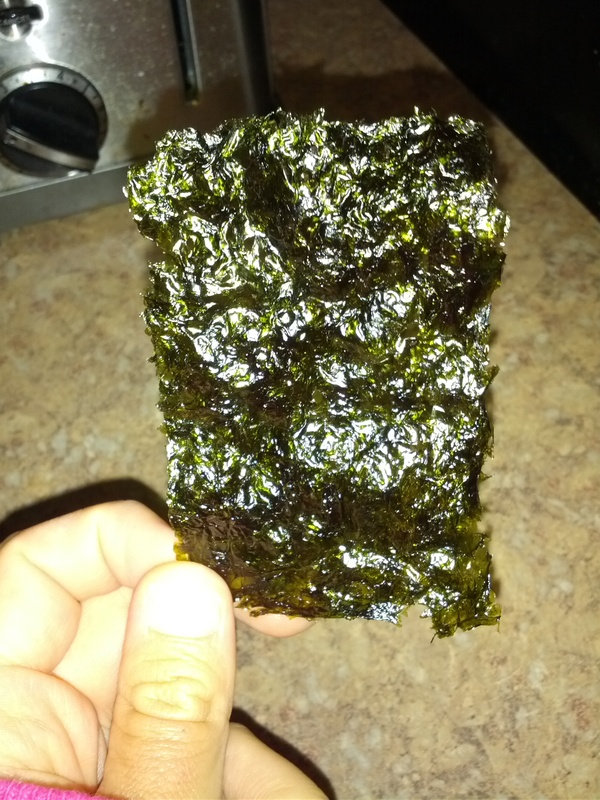 I picked up this package of Sesame flavored Roasted Seaweed Snacks for only $1. Upon arriving home, I opened up the package to try them out. Well, the first thing I noticed was the smell. I felt like I just walked into a fish market selling nothing but smelly fish. The smell of fish that comes from this package is unbelievable. Beyond pungent. Oh my. It was strong. After getting past this, I removed one of the snacks. I found it to be pretty much paper-thin with a greasy exterior. There were some speckles of salt seen on the snacks as well. Without another thought, I placed the entire thing in my mouth and began to eat. The consistency that I found is hard to pinpoint. In no way was this thing crispy. No, no crispness here…as you usually find with roasted items. It was similar to eating rice paper but, a little bit more crinkly. The snack started to almost melt in my mouth and form a very odd, almost gooey like, paste. This was weird. I found that chewy and swallowing the snack as quickly as possible yielded the best results. But, it also yielded a mouth full of one flavor – fish. These would certainly not have the ‘No Burpie’ label that you see on Fish Oil pills. Ohh no…Annie made these with extra burpies. I ended up eating maybe 4 of these before I just had enough. Beyond the fishy, seaweed flavor, I could actually taste the salt of these as well. A good thing…I guess? Beyond a doubt, the consistency of these is just plain bad. Maybe if they were a little less crispy and did not form an odd goo, they would have been better. But then again, I come back to the flavors, and think probably not. I only spent a $1 on these things so I didn’t really lose anything. No, I will never ever purchase these again. Looking back, I would do it all over again. And you know why? Because I am a Foodie. Good thinking! You are not missing anything! !